//	Bike Washing Machine Concept; Exercise and Do Laundry at the Same Time! 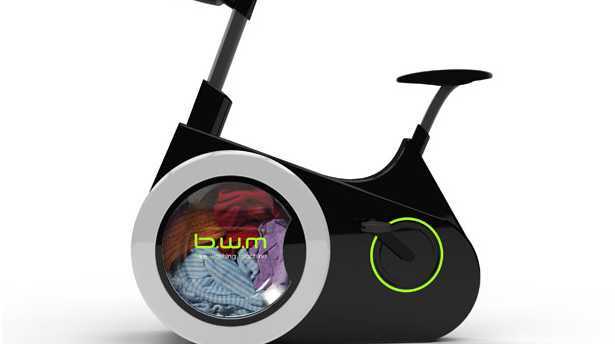 Bike Washing Machine Concept; Exercise and Do Laundry at the Same Time! A new bike washing machine concept that has been designed by students at the Chinese-based Dalian Nationalities University facilitates washing of laundry as one works out. Doing laundry is quite stressful for a number of people with excuses of lack of time and getting “too tired” after the activity. Physical fitness in terms of regular body exercise also attracts similar excuses making it difficult for many people to avoid exercises. Lack of proper exercises and keeping fit has led to the emergence of many weird diseases and health complications amongst many individuals. Regular exercises are good for keeping the body fit, healthy and in the right shape. This newly designed concept imagining a stationary exercise bike doubling up as a washing machine will help in creating time for laundry as well as working out at the same instance. This will keep the “no time for exercises and laundry” excuses away and in a way save costs, time and also aid in keeping the body fit and healthy. Dubbed BWM, meaning bike washing machine, the concept behind the bike aims at facilitating working out and doing laundry at the same time. As the pedals of the bike are in motion, the washing machine’s drum rotates spinning the laundry contained and, as a result, cleaning them. Meanwhile, extra electricity is also produced at the same time. The generated electricity is sufficient to power the BWM’s display screen or even stored. This bike washing machine concept actually revitalizes hopes or rather dreams for people who prefer multi-tasking. At some point, however, it is uncertain how long one might have to pedal through a given quantity of laundry. Given the small size of the washer, it is likely that one might have to pedal for quite a long time to achieve doing a sizeable load of laundry. Unfortunately, the bike washing machine is just a design concept and no production plans are tabled as at now. So far, the Dalian Nationalities University students who designed the concept have not hinted on any further plans neither have they commented nor responded to inquiry comments. The new bike washing machine is not the first of its kind, that is, part-bike and part-washing machine. Designer Barbora Tobolova developed a concept that took the above bike washing machine concept further by enhancing its actual motion. Tobolova’s theory ideally entails having a moving bike that simultaneously washes clothes. Barbora further explains that BiWa (as the latter concept is known) also allows used dirty water from the laundry out and terms it as “an ecofriendly urban mobility”. The future has bright ideas that will foster multi-handling of activities through simple concepts turned to actual projects.